GHMC would integrate database of all city departments to the master data. Hyderabad: The Greater Hyderabad Municipal Corporation has decided to embark on a massive survey and geo-tag every property both (Government and private) in the Hyderabad Metropolitan Region, which spreads over 7,257 square metres. The civic body plans to geo-tag roads, water and sewerage lines, residential and commercial properties, water bodies including kuntas, nala, ponds and lakes. This is spread over seven districts, 70 mandals, 1,032 villages and 175 villages in HMA region. The corporation will take up the survey with its own staff at an estimated cost of `50 lakh. The survey is likely to begin by August end. Besides this, the corporation has also decided to facilitate properties and other iconic structures with geographic information system (GIS), where citizens can obtain complete details of that particular property with history and changes that it underwent over the years. Terming it as the city's master data, the corporation officials claimed that it would be useful to regulate illegal activities, will help in better traffic management and uniform growth of the city. The master data includes circles and zone boundaries of department pertaining to GHMC, parcels of residential, commercial, and government buildings, basic amenities (police stations, hospitals, schools, banks, ATMs and fire stations etc. ), over-ground and underground utility network lines, roads, railway features. It would help achieve not only the desired transparency and ease planning processes but also facilitate efficient and effective tools for development and management of HMA area. It enables a faster response to the changing ground realities in development planning, owing to its in-built scientific approach and open-ended design. GIS technology is used for capturing, storing, checking, and displaying data related to each house and street in the city so that the authorities can see, analyse and understand details of a house or property like built-up area, details of property tax, electricity and water bills etc. 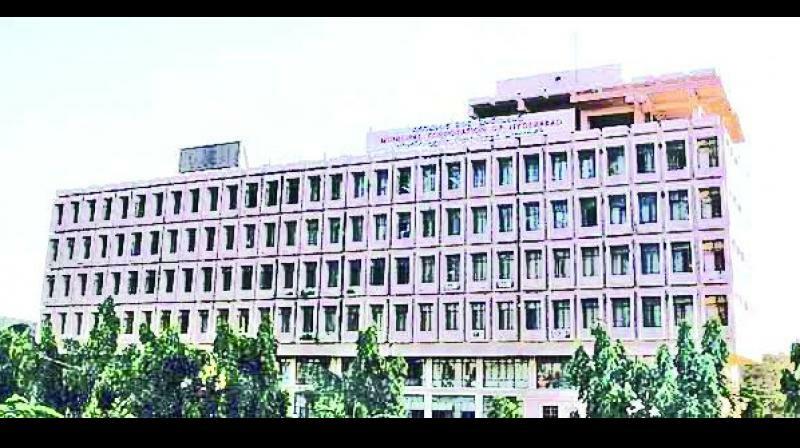 A senior GHMC official said that the civic body has been preparing ground to use information technology in a big way. "Reaping the benefits of the IT revolution in the corporation since four years, the civic body has decided to use information technology for providing better civic amenities and facilities to people", the official said. He said that the proposal has already been discussed with the Municipal Administration and Urban Development Minister Mr K. Taraka Rama Rao and it would be taken up by the IT wing in the civic body. He said the corporation would use their own staff since hiring a consultant would be a costly affair. He said that the consultants have been demanding `10 crore to take up the survey. The GHMC official said that the master data will specifically help the city departments to minimise the irregularities. He said that all information pertaining to GHMC, HMDA, HMWSSB, TSSPDCL and other city departments will be integrated with the master data to minimise the complexity and provide a common grievance re-addressal system by developing a common website. Citizens can also verify the property and land details and real time traffic from the website. The survey will be completed by December, and geo-tagging and GIS exercise will begin from January", the official concluded.